Paraphrased, this says: look after your customers before you go anywhere near trying to get new ones. Next, support the rest of the company selling the whole toolbox to solve customer needs (software was typically only 10% of a project sale). Finally, if we’d done those first, only then did we try to make profit for our own unit alone. The other euphemism we knew was an old American Football one, which describes a now illegal play; that of “smacking the helmet”. That’s the crash helmet of a 30 stone athlete running at you, as anywhere his head ends up heading, the full weight of the body will follow. So, a well aimed deflection early in a move causes a disportionate effect when the rest of what’s behind it follows. And in the IT market, that front end constituency is the software development community – aka “Developers”. Hit that effectively, and you’re in great shape. In theory, it’s a great time to be a software developer. Hardware, Storage and Network capacity is fairly inexpensive. Tools to build everything from Mobile to Enterprise applications are predominantly open source and available to all. So, a lot of the early decision making for where to site your applications is where you find a cost effective on-ramp – and more often than not, you’ll stick to where you first deploy as your business scales. When you are a developer, you get to hear about Amazon Web Services (AWS) and their fantastic growth. This a result of their CEO Jeff Bezos telling his staff that they would deploy all their businesses as APIs, and allow other companies to use their spare compute/storage capacity. Spikes in demand necessitate massive over “just in case” provisioning, even though those spikes are few every year and very seasonal. That said, the amount of options on there is now wide and complex, and hence a learning curve before you can price your development hosting cost out. Examples here, but for my needs, it would be circa £80/month. You also get to hear about Google Compute Engine, which open up Google’s capacity to developers who can write to their own specific APIs; that said, they appear to favour apps that can take advantage of their own unique database and auto scaling features. If you want a price, then there is a web site where you can enter a number of parameters, and it will articulate a dollar cost – which in my case, were not inexpensive. Or you can have a crack at this. Likewise for Rackspace, who do a lot of work among the startup community, but again who have pricing suited to paying for their excellent support services. Most of which developers don’t actually need while starting to build their systems. Examples here. The main appeal to me (like a lot of developers) is that you can provision a server instance with one of a range of prebuilt Linux configs within 5 minutes. And once it’s up, it’s $10/month for a virtual server instance with 30GB of Flash Storage and 3TB of Network Bandwidth per month. Add a further $2/month to get weekly backups and the ability to take as many snapshots of your system(s) as you feel comfortable. Very simple, predictable and does the job. The words you’re reading here are being served off a Ubuntu Linux Server in Digital Ocean Amsterdam, using a WordPress network I built using one of their available images. DIY, not for everyone, but if you know what you’re doing and you can secure your site, it’s about as cost effective as you can get. Besides seeing the volume of site growth, I look at the Netcraft Hosting Provider Switching Analysis, which gives an indication of how each provider was both growing or churning its customer base – and if there was churn, where it was going. The thing that struck me were the number of sites that were relocating from AWS and in particular Rackspace over to Digital Ocean. At a time when Rackspace have been giving profit warnings, the numbers were over 4 figures of customer sites per month – some 31,279 sites in a year. Mention Digital Ocean to Rackspace staff (I know two of them), and the best positioning I have from them is that they have many competitors that keep them up at night. That said, I shake my head and wonder if they’re spending all their time looking at new customer acquisition (bath taps at full bore) while leaving that very large plug out of their bath. 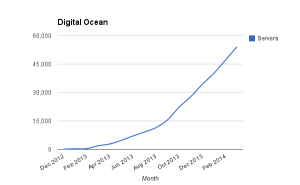 With that, Andreessen Horowitz yesterday put some major VC funding into Digital Ocean. Given they are gobbling market share – and that my gut says it’s heavily developer focussed – I think they are a fantastic bet. I wonder when AWS, Azure and Google will have a comparable offer, and until then, i’m sure progress will continue on the current relentless path. 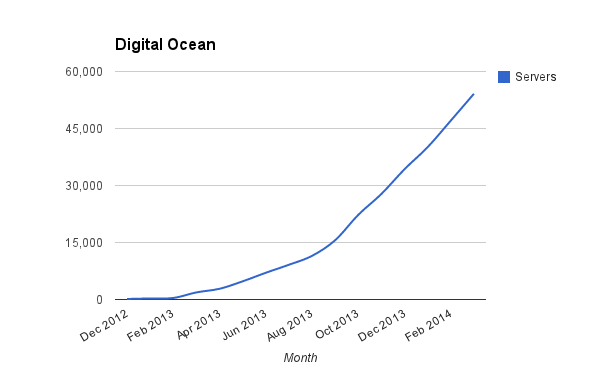 Digital Ocean have been a revelation to me so far. Well done, a16z. You’ve picked a great team. Again.